As I navigate my forties, I acknowledge that time will gradually go by faster and accelerate until before I know it, I will be either very old or dead. In optimistic terms, I attempt to articulate these factors to my clients in a way that emphasizes how important it is to “seize the day” and live one’s life to the fullest. For many, this contention would be considered axiomatic. I believe that people need to visualize their life on the best of terms, and it is helpful to look at time as a discrete and limited resource that needs to be well managed. I alluded to this idea in a previous blog, that I would encourage the reader to go back to and read again. In summary, it’s important to acknowledge that a year is only a number, and should view the concept of time accordingly. 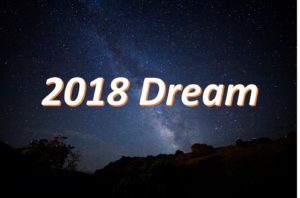 Enjoy the rid because the 2018 Dream will soon become 2019. Jung, C.G. (1952). Synchronicity: An acausal connecting principle. In R.F.C Hull (Trans. ), The collected works of C.G. Jung. (Vol. 8). Princeton, NJ: Princeton University Press.